Today was craft day around our house. 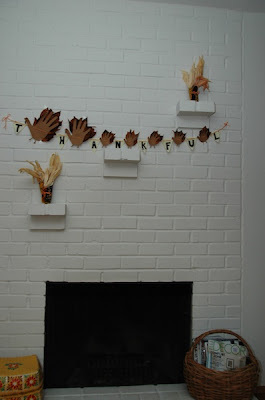 This banner is made from our handprints (Tom Turkey Andrew, Hen Turkey Shannon, and five Blake Poults). This project reminded me of my nanny days and I am glad Blake is old enough to pitch in. I am sure the neighbors think I am a horrible mom because I let Blake crawl around on our driveway while I picked up leaves. Blake was filthy by the time I was finished and I let him chew on all the leaves (how am I to stop such a wee one). I figured I have never heard of a child who died from licking leaves. He doesn't have teeth yet so he didn't shred them! Okay, I am probably grossing people out by now. We are thankful for so much and are having a blast watching the seasons change (even though it is still in the 70's).